The sacramental life of the Church provides us with celebrations that use the most average of symbols and signs within the ritual of prayer. We are washed in the waters of baptism, nourished by Word, bread and wine, strengthened and anointed with oil and held within prayer. It is the preparation and celebration of sacraments that gives meaning to our lives. The seven sacraments of the Church are moments of grace: baptism, confirmation, eucharist, reconciliation, anointing of the sick, holy matrimony and holy orders. 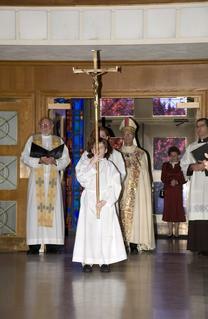 Find out more about the preparation and celebration of sacraments in our parish community.